It’s heating up in Australia. One of the most delightful ways to cool down is with homemade ice blocks. Most icy pole recipes have a lot of added sugar, here are some healthier but equally as tasty alternatives. You can usually buy inexpensive ice block moulds from discount stores. Watermelon with a hint of rose. 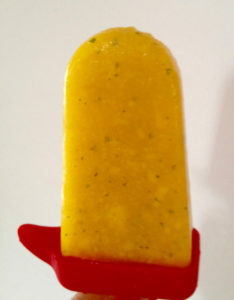 Mango, lime and mint aka heaven on a stick! Cucumber and apple for a savoury edge. What’s your favourite icy delight?